I finished a new pair of pajama pants last night. These have *pockets*. The pockets are a little on the small side because I forgot how big the seam allowance was, but my phone fits in both of them, and that was my goal, so I’m declaring a success. Also, now I know how to do side seam pockets, which means I can add pockets to everything. Like the two skirt patterns I got last weekend, or skirts I already own. This pair of pants is plain cotton instead of flannel, because I wanted something less warm. I used the same pattern that we did in class, with several adjustments to make them fit better. It mostly worked out, but I have a few more tweaks to make before I decide they’re good. They have a weird little bulge on the sides which I am fairly sure I know the cause of, but not how to fix it without messing other stuff up. My next project is a lunch bag, since the tote bag I’ve been using is too big, and I want to see if I can figure out how to put a zipper in. Then I have a simple present to make, and then…probably shorts (i.e., these pants with shorter legs) and another attempt at a t-shirt. 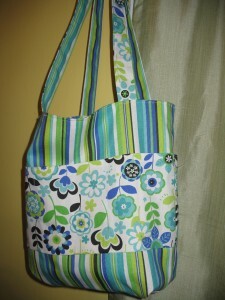 Though I already bought some skirt patterns and fabric for a new bag during a recent sale. I already announced this on Facebook and Twitter, so apologies for the repeat if you follow me there, but I made my first pro sale! “Pictures in Crayon” will appear in Daily Science Fiction some time in the next several months. This is the 20th story I’ve written, or so. The first story I ever sold was my 10th. I wonder what I should expect of my 30th story. In other news, I won a speech contest for Toastmasters on Saturday. I have a trophy and everything. Next weekend I have to compete again against people from a larger geographic area. If you ever saw me give a presentation in school, know that I’m laughing right along with you at the idea of me winning anything other than “most stutters per minute” or “best depiction of a tomato”. I find a lot of things about Toastmasters rather dorky, but I can’t deny that it’s been helpful. In other other news, I finished my pajama pants in sewing class last week and have been wearing them around the house since then. Tonight we start our t-shirts. I couldn’t find fabric I liked for mine, so I have some plain black knit. My goal is to get the pattern and sizing worked out so it fits right (because different parts of me are different sizes) and then buy some cool fabric I found online and make some nicer tops. This weekend I also got most of the way through a second tote bag. I made a tote bag! We finished them in class tonight. 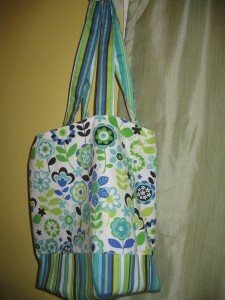 This is the Double Duty Bag from SewBaby, the shop owned by Ann Brodsky, who taught the class. The bag is reversible. 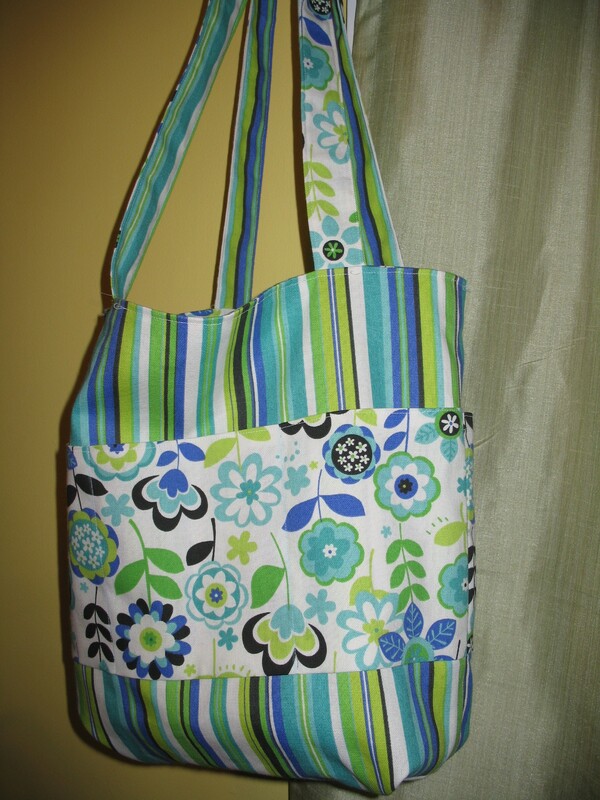 The strip of flowers on the striped side is pockets (three on each side of the bag). I’m using that side as the inside of my bag. Yes, the flowers on the pockets are upside down. I didn’t know how to read the pattern when I laid out the pieces. This will be my new lunch bag. It’s a little big for that (though some days, it’ll be my breakfast/lunch/dinner bag) but I need a new lunch bag and I’m too happy with this one to not use it. I enjoyed the process. I forget how many seams I ripped out while I made it. Also, sewing requires a lot of ironing. It’s probably good that I didn’t know that before I signed up. Also also, I apparently did not learn how to use scissors in kindergarten because I did not cut my fabric in straight lines. Next week, the pajama pants and t-shirt class begins. I have to go buy the pattern and fabric on Friday afternoon, on my way to a writing retreat. So I might spend part of the retreat cutting out the pattern. I’m planning to get a sewing machine and keep this up. I’m going to make more bags–if you look closely at the photos you’ll see that I need more practice sewing in straight lines. 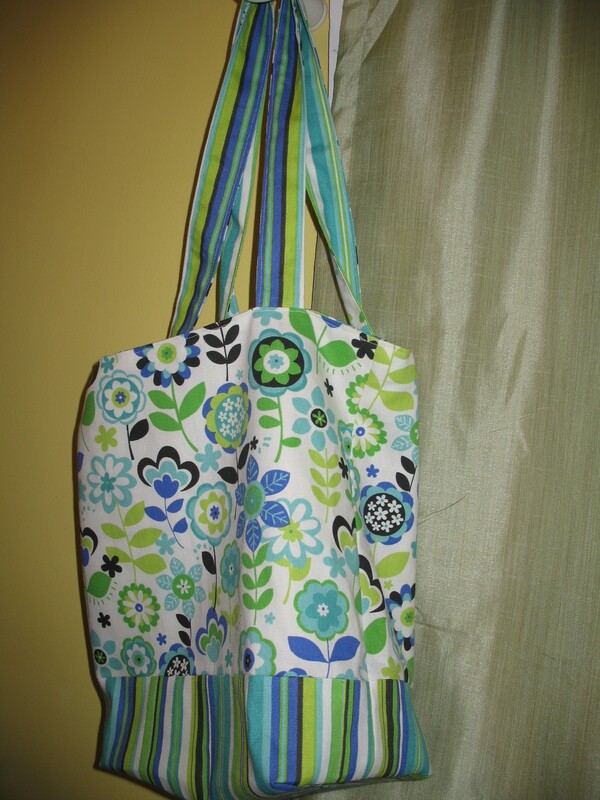 Plus, having extra lunch bags would be useful (and I have a plan for making the pattern shorter and wider) and we never have enough reusable grocery bags.